For nearly 10 years, Oceanstar Design has been designing, manufacturing and distributing wooden products for the homes and families to the European market. With our leading expertise on wooden product and its exceptional quality, in June 2006, we have introduced our first wooden hamper into the U.S. market. Our headquarter distribution center is located in beautiful southern California. Oceanstar Design has always operated with a simple code of conduct: Quality first - Production next - Safety always. Availability: Typically Ships in 1-2 Business Days. Accomplish a modern contemporary design for your bed or bath setup by adding this laundry hamper to your home décor. 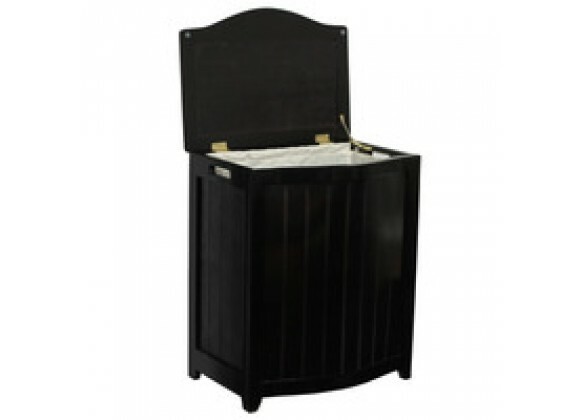 This laundry hamper is a highly durable wood construction hamper with a solid build; it adds durability and elegance to any room and helps to keep your room neat and contemporary. This laundry hamper comes includes a canvas bag and double hinges with hardware and other accessories to assemble. Rubber bumpers are also included on the lid which help to prevent damage to the hamper. Two hand grips on the side allowing you to easily carry your clothes to your laundry room or you can also take out the canvas bag to your laundry room. This beautiful hamper is widely functional without losing the class and style to your room. Assembly required. Bowed front design for added style. Hand grips on both sides for portability. Laundry hamper is lined with a canvas bag. Rubber bumpers for lid to prevent marring of painted surface. Enamel coating for durability; appearance; and ease of cleaning.